When I arrived in Fremantle, I was struck by how odd the Australian landscape was ... It always worried me that there was no focal point in it, so I simply thought, well I'll paint it and I’ll leave the focal point out. Following his return to Australia in 1957, and strongly influenced by the post-impressionists and Cézanne in particular, Fred Williams began to create images exploring the symmetry and spatial ambiguities of stands of eucalypt saplings. which signals how far Williams would go in his abstraction of the landscape. This work was a finalist in the 1961 Wynne Prize and was acquired by the Gallery in 1964. Signed l.r. corner, black oil "Fred Williams.". Signed u.r. verso on hardboard on label, black ball-point pen ".../ FRED WILLIAMS". Hemisphere , Sydney, May 1982-Jun 1982, 374 (illus.). Sasha Grishin, Australian painters of the twentieth century , 'Fred Williams', pg. 184-195, Sydney, 2000, 186 (colour illus. ), 187, 188. Deborah Hart, Tom Roberts , 'In the footsteps of Tom Roberts: Fred Williams and Arthur Boyd', pg. 87-91, Canberra, 2015, 88 (colour illus. ), 351. Barry Pearce, Art Gallery of New South Wales handbook , 'Australian', pg. 13-35, Sydney, 1988, 34. Ursula Prunster, Australian painters; Seeing Cézanne , 'An era of staunch individuals: the 1940s to 1960s', pg. 9-12, Sydney, 1998, 10, 28 (colour illus. ), 31. cat.no. 55. 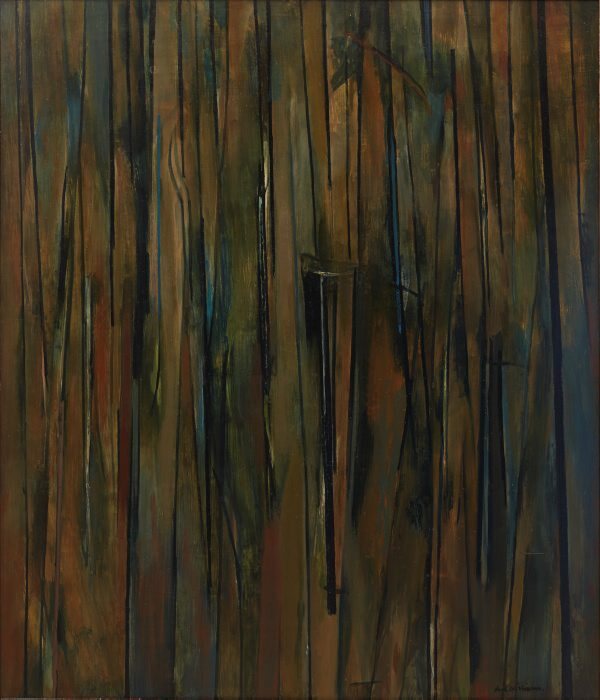 This work is referred to as 'Sherbrooke Forest 1'.